A simple tip for bloggers and site owners: If you want to monitor your page views but don’t want any fancy statistics and without installing heavy scripts / plugins, then this tip is for you. If you have a Google AdSense account and you have an ads in your site, you can monitor your website visitors by its own ads report. 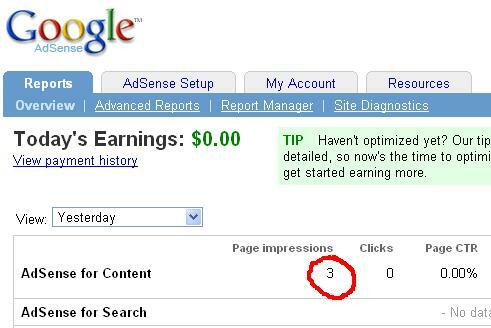 On the Google AdSense report, there is a column called Page Impressions. Page Impressions mean the number of times the ads has been rendered, which is somewhat equivalent to the number of time your website has been view. The good thing is that only unique page views are recorded. This is useful if you have small monthly bandwidth, or you don’t want to add extra plugins like statistics that would make you site load much longer. For those who want a detailed statistic reports on your website, then get the WordPress Stats plugin (WordPress Blogs only). This entry was posted in Page Views, Site Optimization, Web Development and tagged Google AdSense, monitor page views, page impressions, Page Views, tip. Bookmark the permalink.